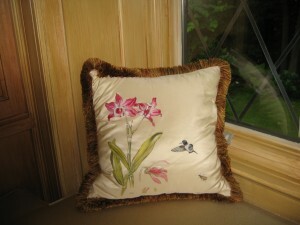 Hand painted fabric can enhance pillows, drapes, table cloths, runners, napkins, etc. Use good fabric, such as silk, but make sure it does not have a protective coating like Scotchguard, or the paint will not adhere. You can buy fabric paint in a craft store, acrylic artist paint will also work. The paint will not come off, if it gets dirty you can have the item dry cleaned. You may chose to replicate a design or picture or take the design from a fabric you have in your home. You can also use ready made stencils. You can vary the look of the stencil design by applying more or less paint. The brushes, stencils and paint are available in craft stores. To transfer design or picture to fabric, use carbon paper under design and trace over. You can buy transfer paper or transfer pencils at craft stores. If you are nervous by accidentally transferring paint to surfaces you are not working on, just mask over the parts you are not painting with painter’s tape. 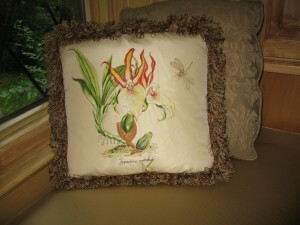 I hand painted this pillow myself using pictures from a library book. This page was very educating, I hope there will be more to come from the Three Sisters blog. Lokking forward to more easy ways to enhance items I already have around the house. I loved these pillows–Is there a place I can purchase these?? Three sisters rocks! Would love more Block Island posts! Any ferret stories? Like Anthony Martin, I am interested in purchasing a few pillows. I will try to make one following your instructions! Get back to you on that! What a Great website! Great Beauty Always, thanks for the comment. We are ABFAB Fans and I am one in particular over 60 with long hair. I was so happy to find this website.I wanted to thank you regarding this excellent read! I certainly enjoyed every bit of it and I have you checked looking at the new stuff you post. I found this blog post to be very . I have already gone through and read many of your posts. They are great! Thanks for reading our blog. We will keep posting!